Butterflies. That’s what they call that feeling of dread you experience deep down in the pit of your stomach before doing something that scares you, or after you’ve done something wrong. Tiny little explosions fluttering around your insides, warning you that things are about to go horribly awry. When it’s over, the butterflies float away and you go back to feeling safe and secure. But imagine if that feeling never stopped. Your stomach churns constantly, turning over and over, because you know that you are one tick of the clock away from exploding. The two main characters in Fat Man and Little Boy are “born” with a stomach full of such butterflies. Every moment is a little bomb about to explode. 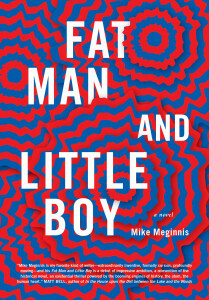 Mike Meginnis’ debut novel, winner of the 2013 Horatio Nelson Fiction Prize, Fat Man and Little Boy is a novel that explodes with anxiety and unease. The explosion is not over quickly and the effects linger for over four hundred pages. Named from the two bombs that hit Nagasaki and Hiroshima, Fat Man and Little Boy appear as two grown men after the impact of their respective explosions. Understanding what their existence means to the rest of the world, the two set off on a journey to find food and money in order to flee an expectedly hostile Japan. But no matter where they try and escape to, Fat Man and Little Boy will never be able to run from who they are. The place may change, but they will always wander around, hiding in the shadows, praying that no one exposes them for the agents of death and destruction that they were born to be. Meginnis is deft in providing context. He wastes no time, and avoids the inclusion of politics or historical background. With simple yet imaginative detail, he brings the reader immediately into the cataclysmic event: “Two bombs over Japan. Two Shells. One called Little Boy, one called Fat Man. Three days apart. The one implicit in the other. Brothers.” The explosion itself is simply described as “pika don” or “flash boom”. It is upon impact that this historic event turns inside out and upside down. The novel, although framed around a historical event, dwells in a place that is both real and unreal. As soon as the “brothers” explode—and are thus “born”—the reader becomes fully aware that the narrative will drift far beyond the normal realm of a typical novel about war. The two bombs, now personified as a fat man who looks like “a shaved bear wrapped in someone’s expensive drapes” and a little boy whose bones stick out like “knobs on a young tree”, apply a face and body and soul to the horrors caused by the creation of the atomic bomb. As though existing in the magical space of a folk-tale or a legend, the devastating after-effects of this mass casualty event are seen through the eyes of the two brother-bombs. Meginnis takes away the hard and blunt edges traditionally used in describing the scene after a bombing, and instead he softens them with subtle yet fantastically descriptive language that is just as unsettling. Although the landscape is piled up with dead bodies and destroyed buildings, Meginnis succeeds at presenting the horror through the strange and somewhat supernatural effect that Fat Man and Little Boy have on their surroundings. As if viewed through the lens of a time-lapse film that has been sped up, Fat Man and Little Boy kneel down next to their victims and watch the bodies decompose at rapid speed. Maggots that take shelter inside of the bodies multiply at an unnatural pace. They rush through their entire lifecycle, immediately turning into flies that land on the two brothers and become immobile. Their final stage is one of “tiny black specks” under the palms of Fat Man. In this upside down world after the explosion, food begins to rot as soon it touches the hands of Fat Man and Little Boy. They use their fingers, quickly eating the rice to keep it from molding. Spores form beneath their fingers…This is getting worse. Neither has spoken to the other of it yet. Fat Man knows this is not normal. As the two flee Japan and escape to France, they continue to leave a trail of rotten food, charred plots of ground and deformed babies birthed from unsuspecting mothers. No matter where the two brother-bombs run to, they will always be a reminder of destruction. This burden of guilt hangs heavy on the narrative, always lurking in the background, but Meginnis is able to lighten the tone by placing Fat Man and Little Boy in normal situations that inevitably become complicated. The two find menial jobs; they move in with a lonely French woman and become the target of two police detectives. These moments add a bit of relief while still tightening the screws on the brothers. The novel reaches a fever pitch when Fat Man and Little Boy encounter a Spiritual Medium that is performing a show for the town. The Medium plucks the two men from the audience and divulges information about what they’ve done and what they are afraid will happen again. The scene builds relentlessly. As the medium attacks them, Little Boy begins to crumble. His guilt and fear begin to build up inside of him like noxious gas. He sweats and cries and begins to expose himself, both figuratively and literally. While this book can be difficult to digest, given the atrocious nature of war, Meginnis relieves the reader of some of this burden by cleverly showing the true realities of war through the strange abilities that are attributed to Fat Man and Little Boy. There is an uneasiness that permeates the novel, wrapped around each sentence. Anxiety, as though something is going to explode again at any moment, follows the two brothers everywhere they go. The suspense lies underneath the surface, beneath the magical and vivid descriptions and the well-crafted prose. The novel never erupts or boils over. Instead, it ticks by, page after page after page, like a doomsday-clock counting down to the “flash boom”. Once the clock runs out on the last page, you can feel the butterflies fluttering around—a tiny tingling reminder that this horror will always be with us and will most certainly happen again. Chad Meadows’ work has appeared in Crack the Spine Literary Magazine and in The Squawk Back, where he is also the assistant editor.